A desire accomplished is sweet to the soul. 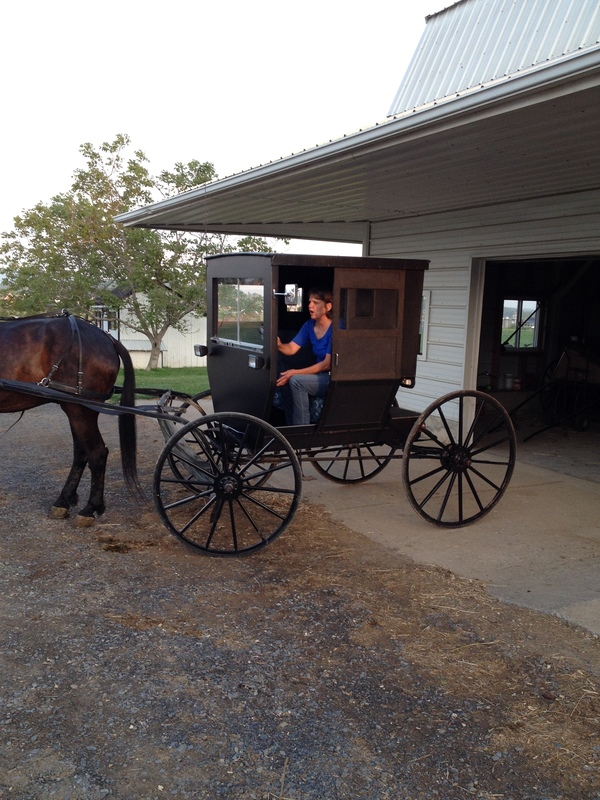 It has long been a desire of mine to spend time with the Mennonites on their farm with their horses and buggies. The day and time were set. On a lovely evening in May, we made our way out to the pristine farm of Mr. & Mrs. K. Two happy Boston Terriers announced our arrival and cheerfully greeted us as we emerged from the car. There lying across the hitching rail in front of us was the clean, black harness all ready and waiting to go. Mr. & Mrs. K walked briskly from their home with the kindest of smiles upon their faces. My friend made introductions and we chatted a bit. I assured them no photographs of them would be taken, nor would their names or where their farm is located be mentioned. They appreciated the respect of their privacy. Now I do not know for sure, but I believe that was a test, and I do believe I passed! First time I have met a Standardbred up close. Mr. K led the sleek black horse from the stall and after brushing him, introduced him to us. It is obvious they think much of their horses. His name is Blitz. 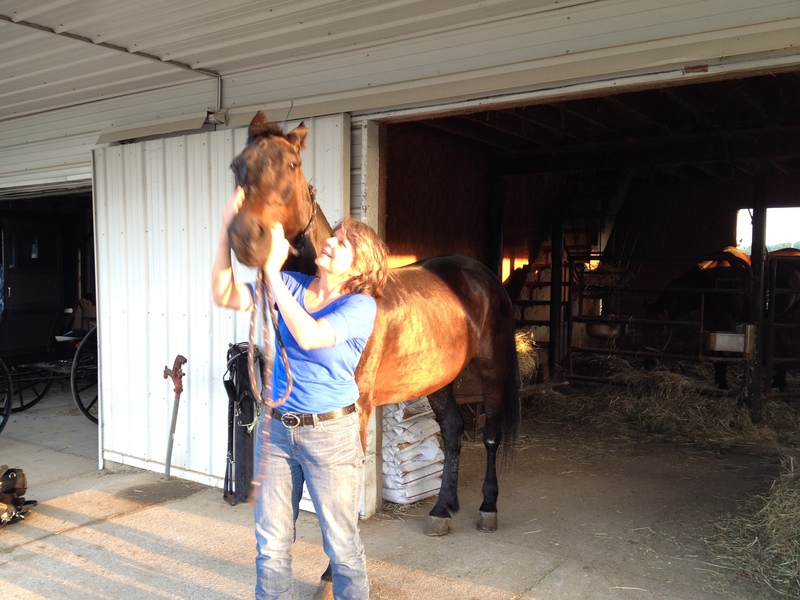 He is a 19-year-old Standardbred. This is the breed of choice for the Mennonites. He stood 15.3 hands. Mr. K prefers geldings over mares. 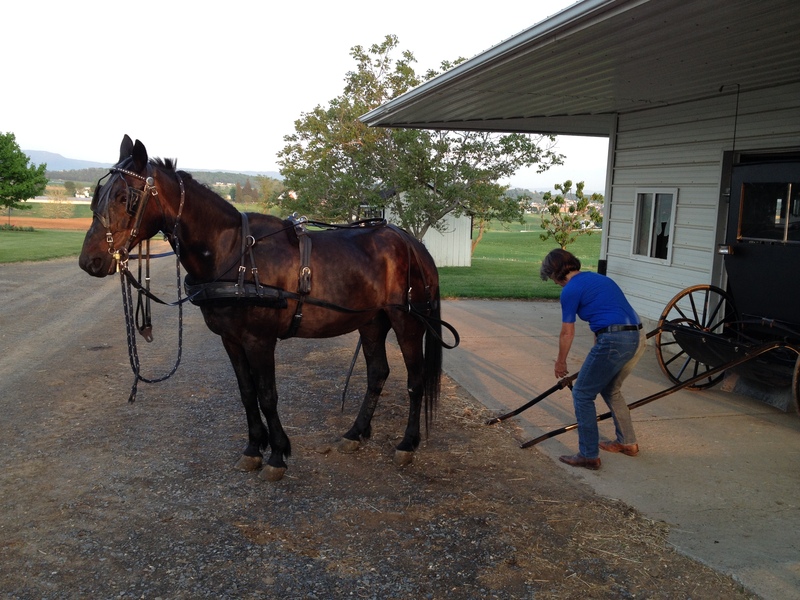 There is something interestingly different between pleasure horses and real working horses. It was easy to see Blitz knew what he and his job were all about. He is a professional. “Ok, harness him. What goes on first?” asked Mr. K. About this time their pleasant daughter, also full of smiles, joined us. I put the bridle on first. Already a mistake! There were two bits and I missed the checking bit. This bit is connected to a leather strap that goes over the head and attaches to the collar of the harness. 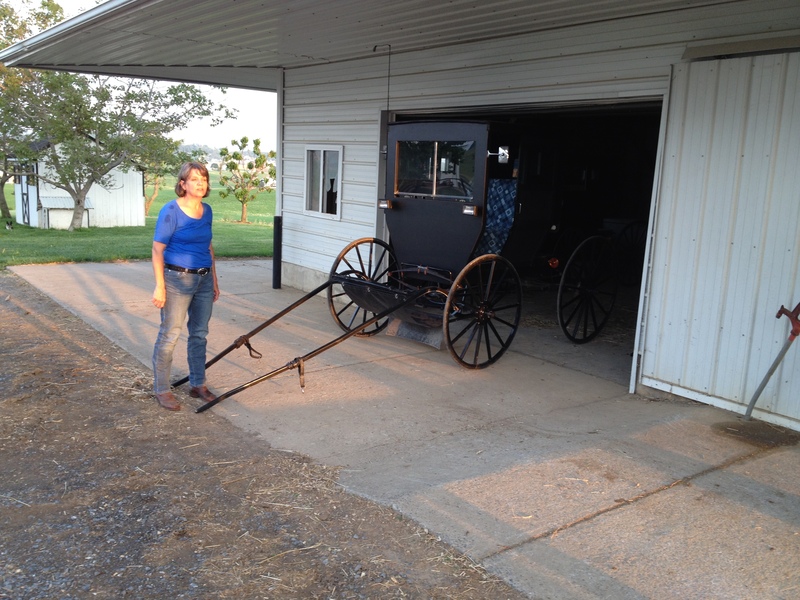 Mr. K proceeded to slide open the other barn door which revealed three neat and tidy buggies. The buggies weigh a bit over 700 pounds. “Pull out the one on the right,” he told me. 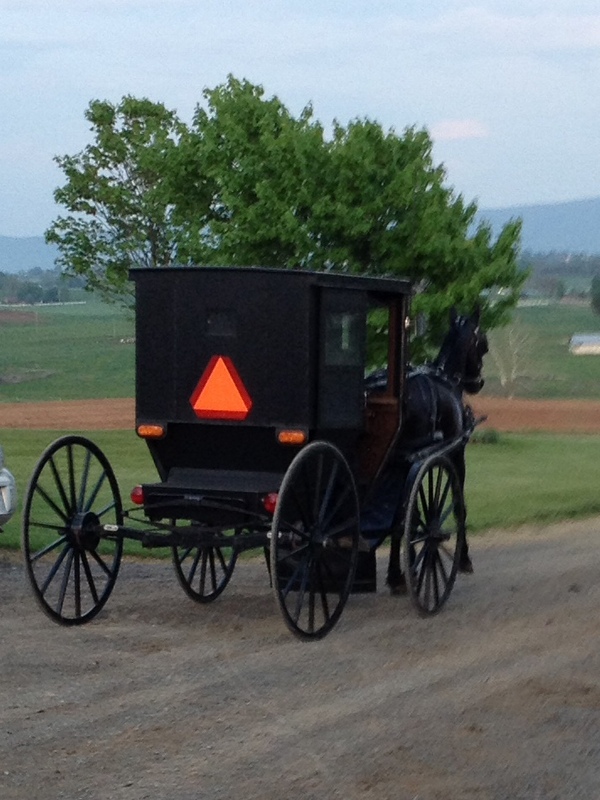 The buggy pulled easily from the barn. I set the traces gently down on the concrete pad. “Now tell Blitz to come over,” he said with a big grin on his face. Well, I tried twice, the second time with a bit more force of command. Blitz is no dummy. He did not move one hoof! “Get over there, Blitz,” came the firm, yet quiet command. That horse knows who butters his corn. In double time he walked over to and backed up between the traces! Mr. K double checked the harness and helped me hitch the buggy to Blitz. Blitz walked over and backed into the traces! The buggy was clean and orderly on the inside. It was now time for the long awaited ride. The buggy was clean and orderly on the inside, covered with a soft material and soft comfortable seats. They weigh a bit over 700 pounds. The buggy lights and signal lights are powered by a battery. There is a heavy plastic windshield that can be opened for fresh air or closed in inclement weather. In the windshield are two small openings for the reins to go through. I sat on the left, Mr. K drives from the right. He closed the windshield, threaded the reins through the openings, clucked quietly to Blitz, and off we went! Blitz immediately set his pace. The steady cadence of the trot, the wheels and the harness all joined together into the most pleasing of sounds to the ear and soul. Winston Churchill said it well, “The outside of a horse is good for the inside of a man.” Mr. K made me laugh when I remarked about how Blitz’s ears were cocked back listening to us talk. “He’s not used to people talking so much.” Funny. 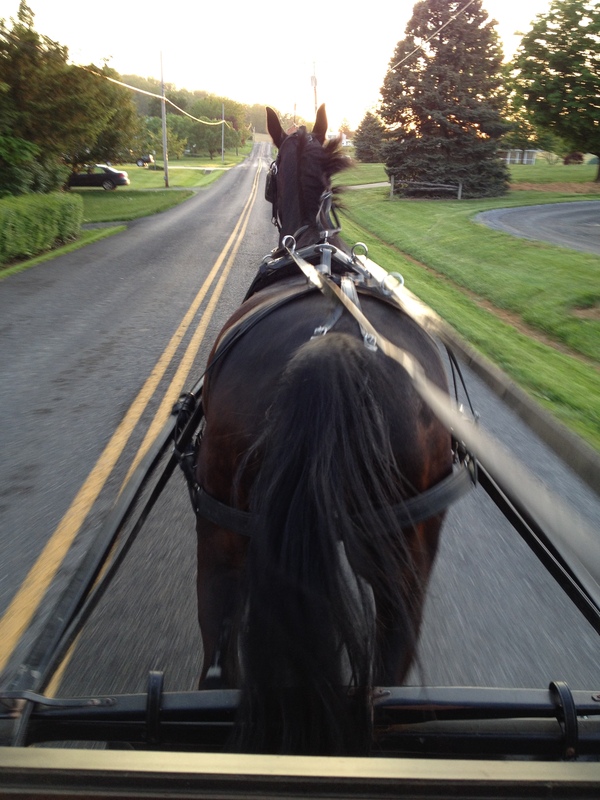 He put Blitz in an extended trot out on the main road and offered the reins to me! The power in those reins was amazing and I was nervous nevermind the car that was coming up behind us. It was a relief when he took them back. The horses go about 8 mph in their extended trot. He put Blitz in an extended trot out on the main road. 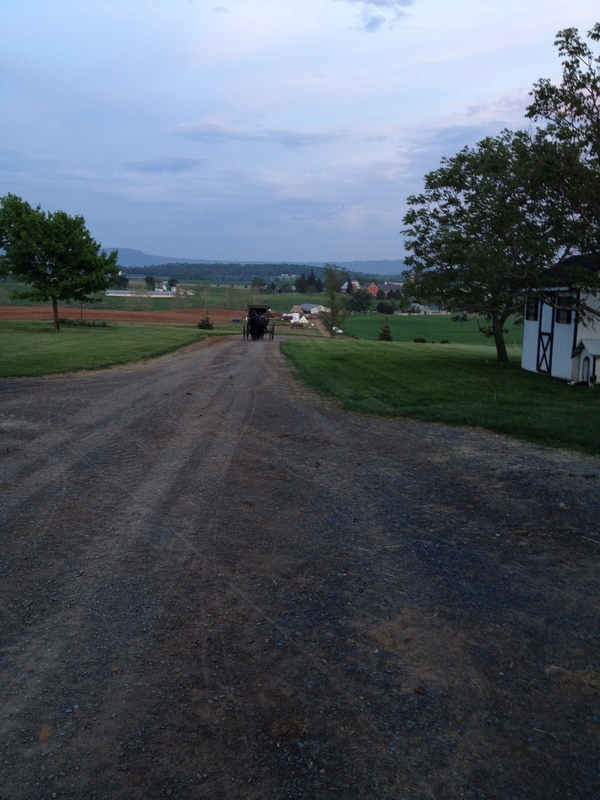 The return ride to the farm was lovely and quiet as I tried to take it all in. There is something special about this quiet, rhythmic lifestyle. When we got back Mr. K also gave my dear friend a ride. After their return, we unhitched that good faithful horse. While taking off the bridle Blitz taught me a good scratch on both sides of his nose was my thank-you to him! I walked him a bit and returned him to his cozy stall. The return ride to the farm was lovely and quiet. As if that was not enough hospitality and generosity from them, they asked if we would like some lettuce and radishes from their garden. Surely a desire accomplished is sweet to the soul. A “thank you” does not seem to be enough. I did take a pie and a pretty Gerber daisy as a thank you; but I missed one thing. I wish I had taken some apples for Blitz, perhaps next time.